Look, a dress! How unlikely. 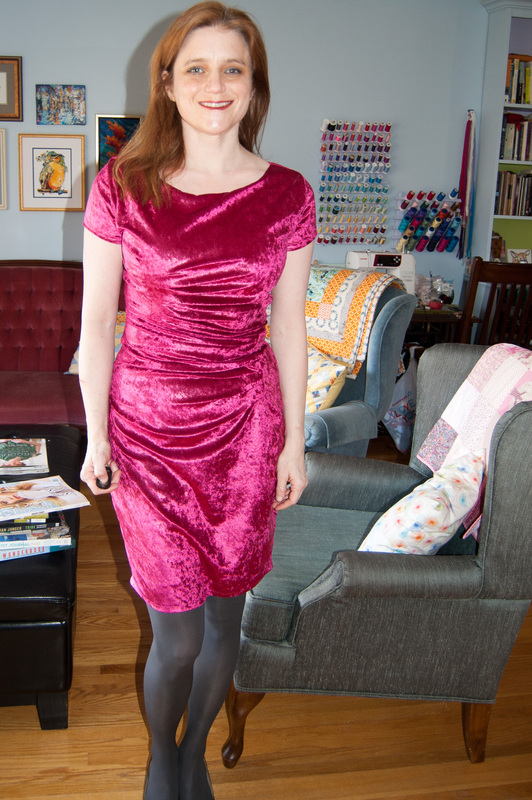 This project is a double-jeapordy impulse project: the pattern (V8946, now OOP) was picked up in the discount bin at the local fabric store for $5.99 (CDN), and the fabric was picked up at Marina’s fabric store on Ottawa St for no reason other than it was pink and shiny. And then it seemed like they would go well together. 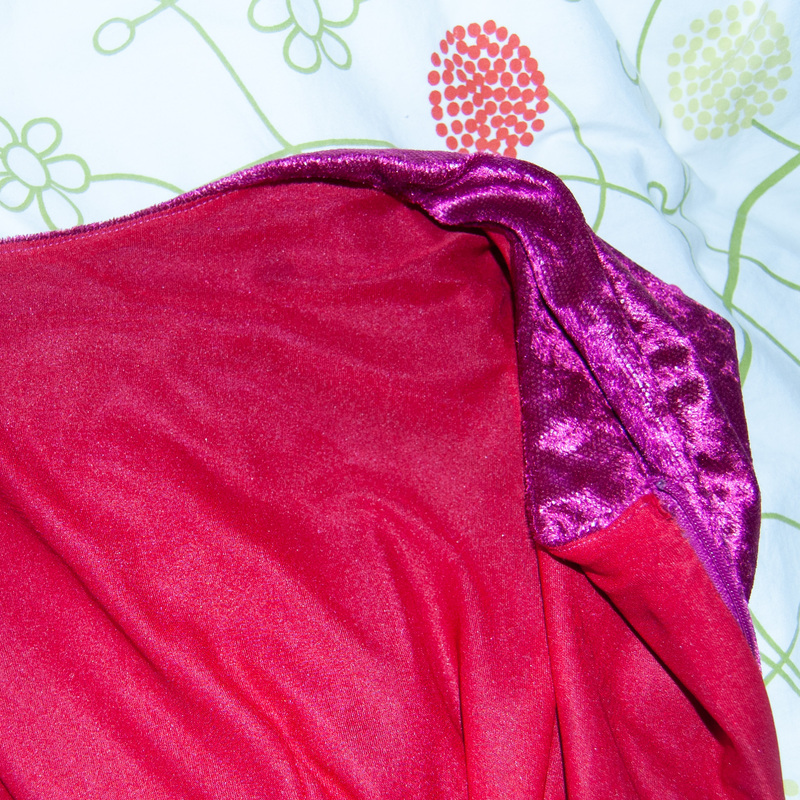 The fabric is a light panne velvet with a very shiny foil print on it–not metallic, more like a varnish finish. 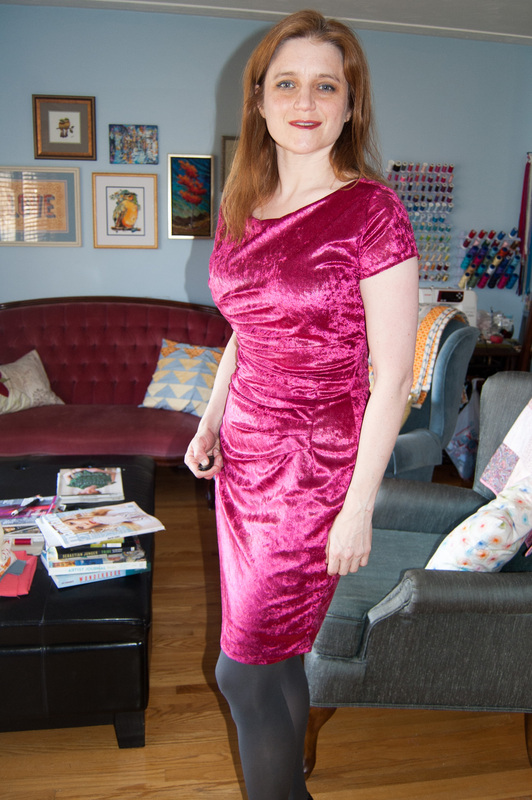 It was a challenge to sew as velvet so often is but I tried not to worry too much about seams going askew so long as it fit in the end.The velvet is not super stretchy; it’s more like a stretch woven than a jersey. I can’t remember how much I got it for, but I know it was under $10/m. This is essentially a knee-length view C. The skirt is quite boxy, so I pegged the hem about an inch on either side, and then didn’t finish the centre back until afterwards so I could see if I needed a walking(/dancing) slit. The front comes in two pieces, a top and bottom, with an asymmetrical seam. This part was relatively simple, despite the pleats: I did a pivot-and-slide FBA directly on the tissue to add a few inches across the bust, graded in to about a 10 at the waist, and then back out to a 14 at the hips. Thanks to velvet slippage the pleats aren’t quite as even as I would have liked but in the end all the seams lined up nicely. The back, though simpler, was more of a challenge. It’s one piece cut twice: fine, except that it’s hard to shorten the bodice back if you need to without a waist seam. On the first try-on the back was a disaster with way too much excess fabric coming out in vertical and horizontal ridges along the zipper. I took about an inch off the centre back length off the top thus hiking up the dress. This is much improved, but still not as nice as I’d like; in order to fix it properly, I would probably need to add a waist seam so I can take excess length out of the bodice back. And if I make up this pattern again in the future, that’s exactly what I’ll do. Sewn up in this fabric, it could not be anything but a party dress; but the pattern is quite versatile and could be work appropriate in something less, you know, shiny. I would not recommend a ponte; it would be too bulky in the pleats. But you don’t need a ton of stretch or drape. The dress pattern is lined; I used a slightly stretchy wisper-lite lining. I joined it to the neckline and invisible zipper by machine and then hand-stitched it to the armscyes. I tacked it to the front pleat seam allowances and front waist seam on the inside to help hold it in place. This is third in a run of BMV knit patterns where the finished measurements are not on the pattern tissue (or anywhere else). Super frustrating. I measured the key points (bust, waist, hips) and chose to sew up between a size 10 and 12 at the waist, grading to a 14 at the hips; 10 in the bodice with a pivot-and-slide FBA traced right onto the pattern tissue using french curves and rulers. Given the extra length in the pattern already from the pleats, I added only width. Extra width at the waistline was partially taken out in the dart along the pleats and otherwise removed from the side seams. Again, in their sizing chart I should be a size 16-20. Good thing I got the envelope down from the one I’m supposed to. So why they have so much positive ease in the bloody pattern–which is then left to the home sewer to discover, quite likely in most cases, after cutting and sewing as the finished measurements are given nowhere–is quite beyond me.